Tim Horton’s Brier is taking place this coming week in Brandon, Manitoba as 17 of the best curling teams battle it out for the Canadian Championship. You won’t be able to turn on TSN next week without seeing some curling action. Team Gushue returns as Team Canada looking to make it 3 Brier wins in a row. Gushue defended their title at the 2018 Brier with an amazing tournament going 12-1 overall to one-up their 11-2 record from 2017. This year Team Gushue enters the Brier favoured to repeat and defend the title, while Team Koe out of Alberta is the co-favourite, after not participating in last years Brier due to their spot in the Winter Olympics. Check out the full list of teams competing here. 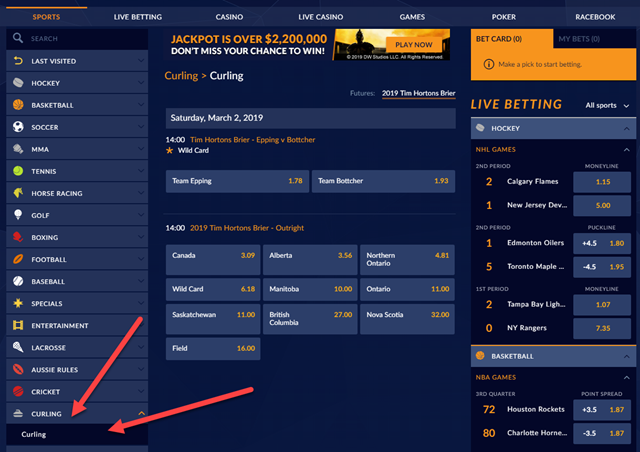 Curling isn’t a sport that traditionally gets a lot of betting action, but considering that it’s going to be featured significantly on TSN this coming week I thought adding this page would be a good idea for those curling fans who are new to betting online. Below you will find a 3 step guide to quickly get your bets placed on the 2019 Tim Hortons Brier. Follow these 3 simple steps to get your bets placed throughout this years Brier. Sports Interaction is our top rated sportsbook for betting on the Tim Hortons Brier. They only allow Canadian players at their site, which allows them to fully cater their sportsbook to the needs of Canadians. This includes taking bets on curling, which you won’t find many other online sportsbooks doing this week. Click here to sign up at SportsInteraction.com. Next you’ll need to make a deposit in order to have some money online to bet on the curling. Sports Interaction accepts a ton of different deposit methods including Visa, MasterCard, Interac e-Transfer, iDebit, paysafecard and ecoPayz just to name a few. You can learn more about some of the deposit options on our deposit info page. I should also note that by signing up through a link on this page you will be entitled to a 100% up to $200 first deposit bonus at Sports Interaction. I always advise new players to take advantage of this bonus because it’s rare that Sports Interaction offers reload bonuses for already registered players. So take advantage. ***In this screenshot you can see the futures odds for the outright winner of the Brier, but during the event you will also find the odds for every individual game (like the wild card draw above the outright winner odds in the screenshot) on this page as well. If you’re new to betting online I also suggest checking out our betting guide section. You will find information about reading betting odds, the bonus clearing information, and other tips that are useful for new bettors. Are you ready to bet? Click here to visit SportsInteraction.com.